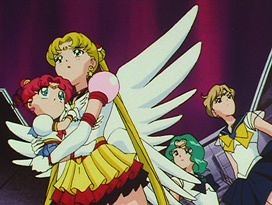 Animation errors in Sailor Moon Sailor Stars, the fifth and final season of the anime. In Sailor Star Fighter's introduction speech, the outer part of her ear is yellow. 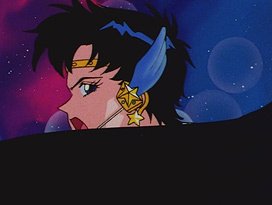 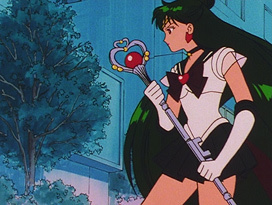 Despite the fact that the Sailor Starlights transform and do their introduction speeches wearing their microphones, they are never seen being used outside stock footage. Hotaru is missing the eyelashes on her left eye. Their shoes have not been drawn. 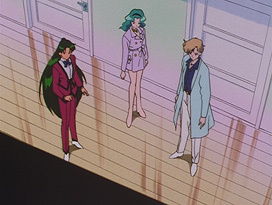 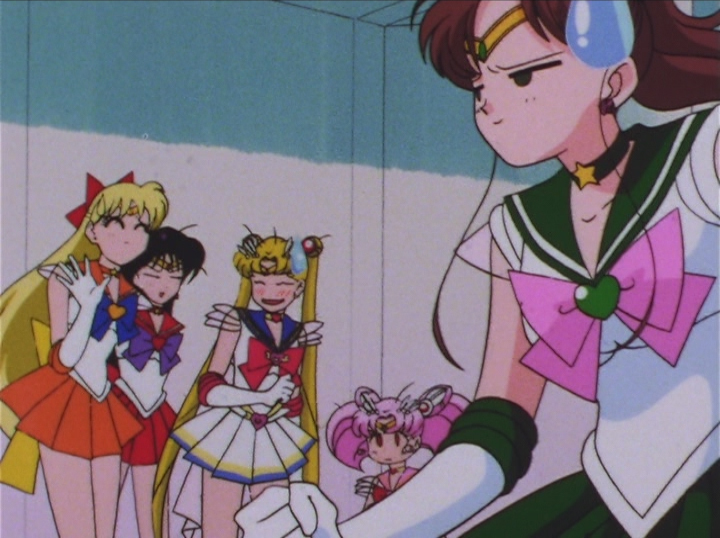 Setsuna and Haruka were wearing brown shoes, and Michiru was wearing white boots in the previous scenes. 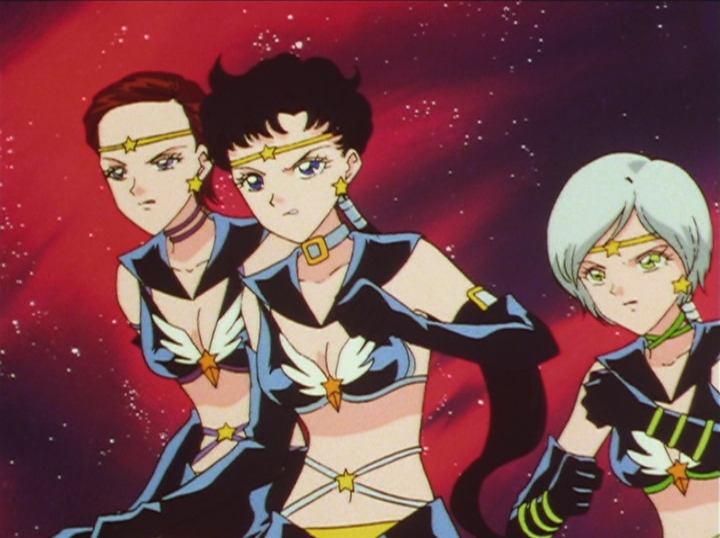 Their shoes have not been drawn. 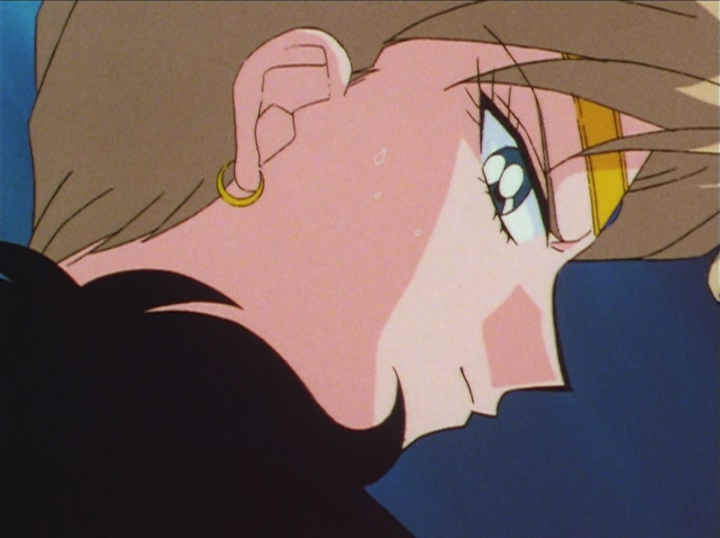 She's missing a part of her hair on the right side, by her sleeve. Her back bow is also not colored in. 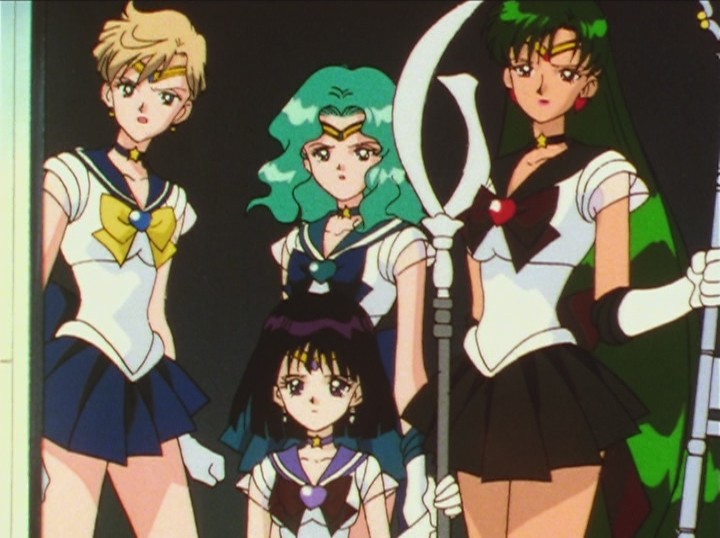 Sailor Venus and Sailor Mars seem to be missing their left arms. 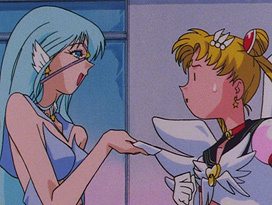 Sailor Aluminum Seiren is missing her vital bracelets. 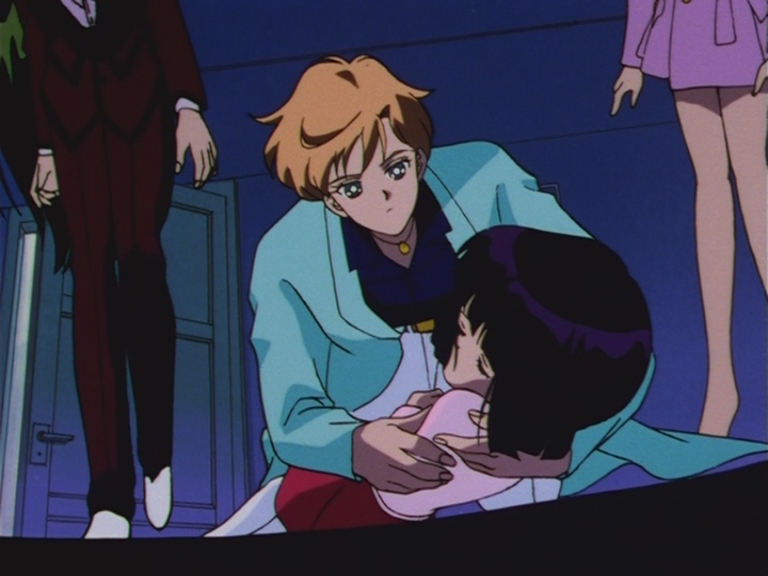 Ami is dressed up as a maid in one of Seiya's flashbacks of the previous episode. 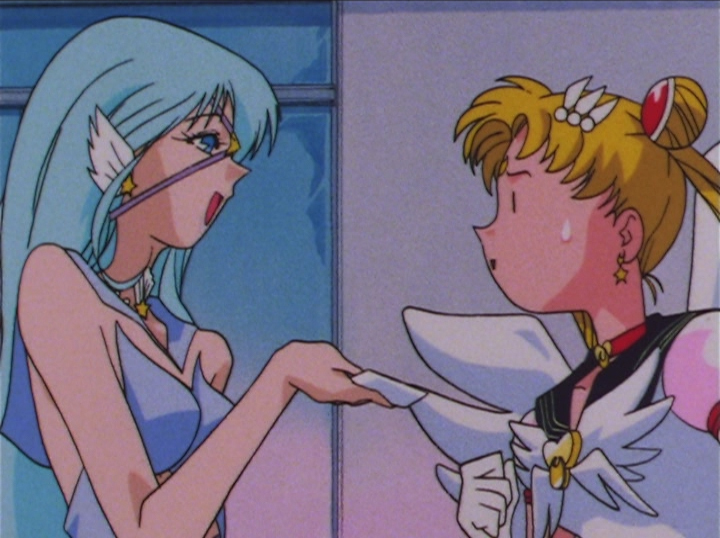 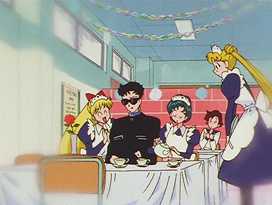 However, Ami never wore the outfit, nor worked at the maid cafe. 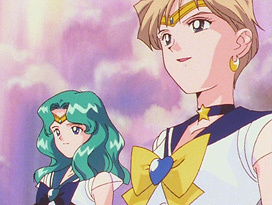 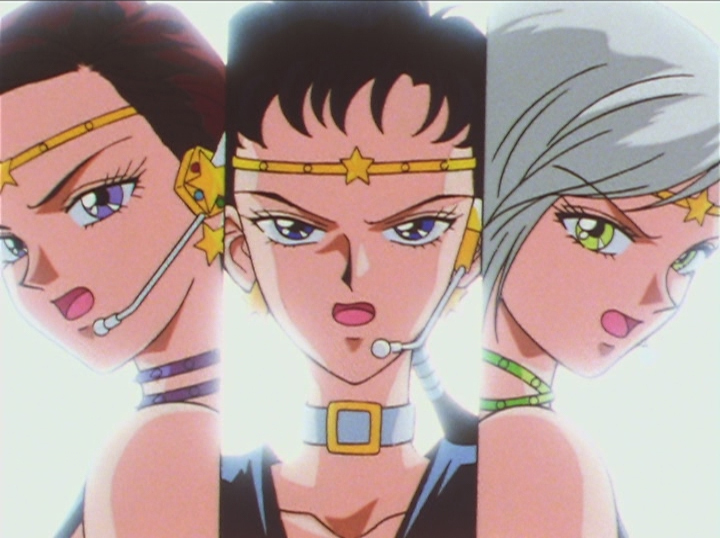 Sailor Uranus' and Neptune's chokers are missing. Sailor Star Fighter's blue arm strap temporarily turns black. 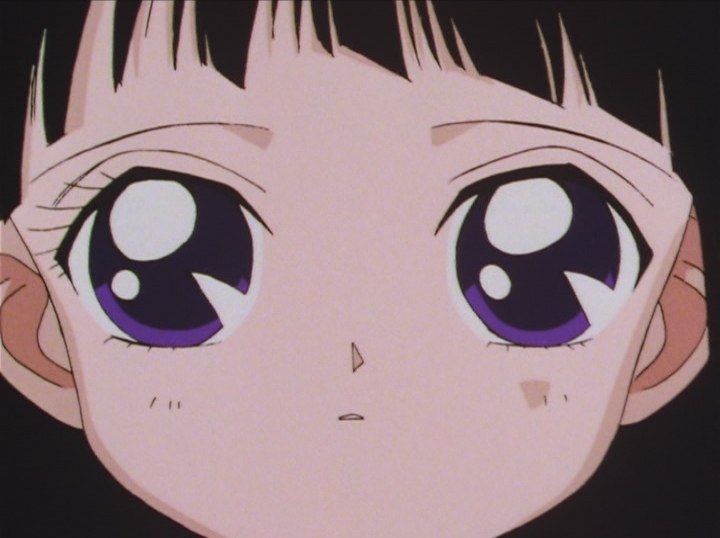 Sailor Saturn's tiara gem turns from white to purple. Sailor Uranus' normally large earring becomes small. Sailor Galaxia's choker is missing its borders. 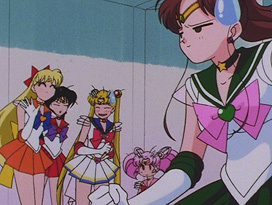 This happens multiple times. 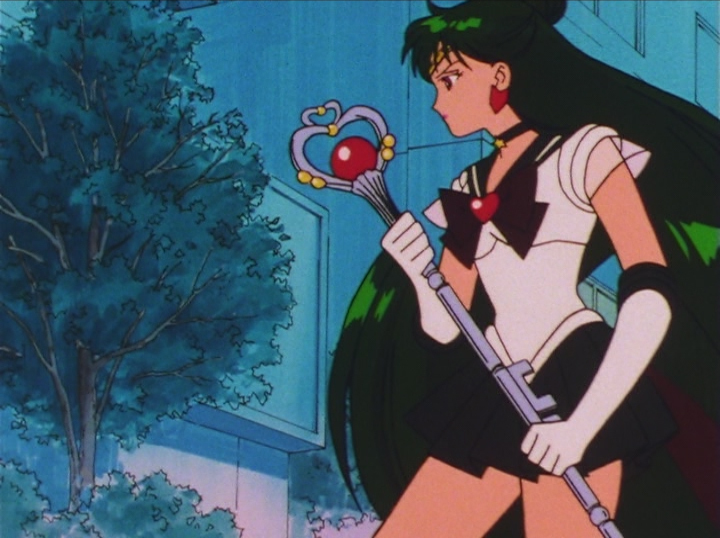 The stripes are missing from Eternal Sailor Moon's collar. 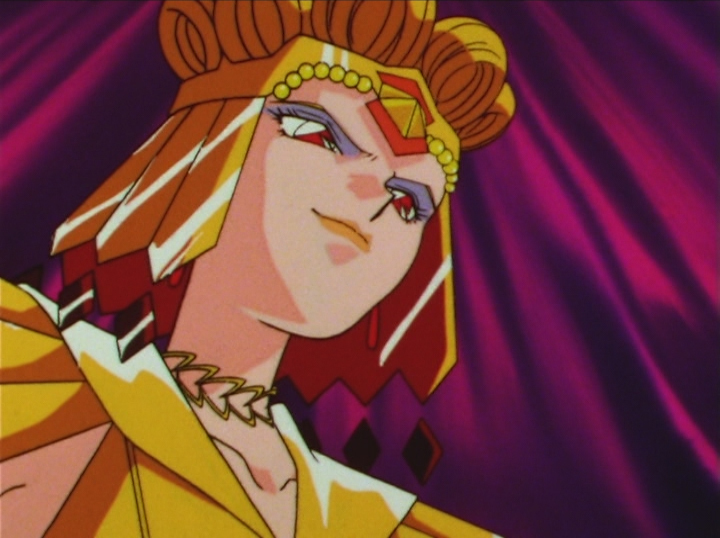 For the majority of the episode, Sailor Galaxia's choker only has the borders colored in. 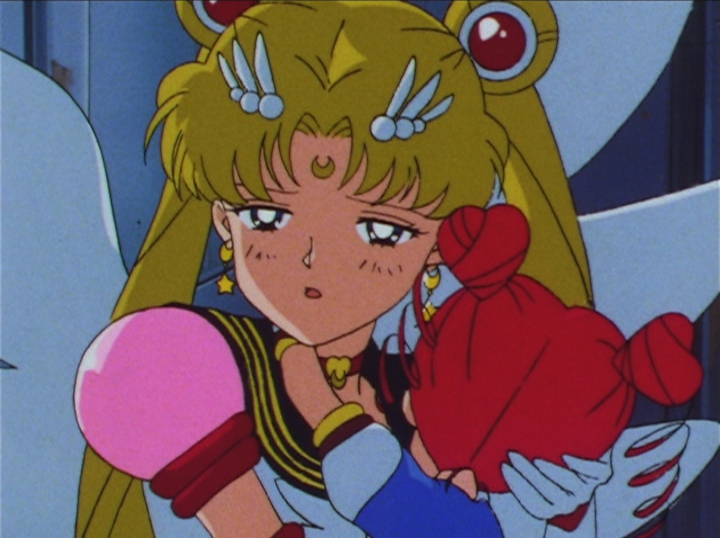 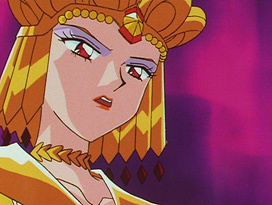 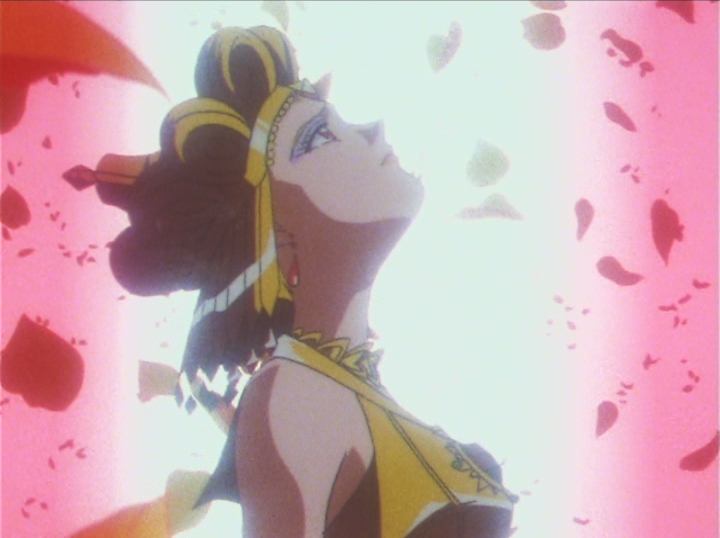 Sailor Galaxia is drawn without her shoulder protectors at the episode's introduction. 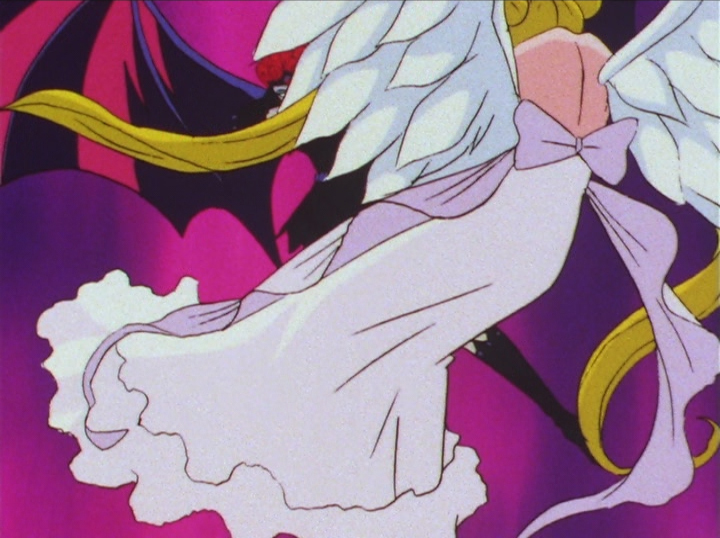 Eternal Sailor Moon's left wing is in the wrong position. Stripes are missing from Sailor Uranus' collar.